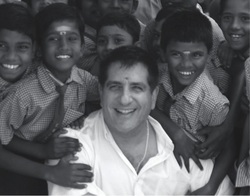 When Joel Evans, M.D., a gynecologist in Stamford, first journeyed to India, it was for the same reason many people travel there: to further his own spiritual growth through the study of yoga and meditation. Now he visits once or twice a year, still seeking enlightenment—but also bringing his gifts in modern medicine to the people there who can benefit from his expertise and contacts with American companies. Evans has “adopted” Padmam Hospital in the city of Madurai in southern India. He donates 10 percent of the income he earns from his gynecological practice, the Center for Women’s Health in Stamford, to the hospital, and also serves as a consultant to help its administrators plan for growth. Last year he arranged for a Fairfield-based medical device manufacturer, Competitive Technologies Inc., to donate a state-of-the-art Calmare Pain Therapy device, which has enabled Padmam Hospital to become widely recognized for treating chronic pain. When in India he works at the hospital, providing free medical care to area residents, and also helps arrange and run medical camps in remote villages.